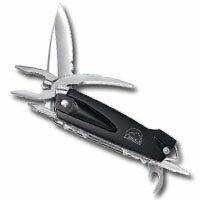 The Buck Knives X-Tract, dubbed a multi-tool, is better defined as a great knife with a few extra features; to call it a multi-tool would be like calling your car a portable air conditioner/radio. Sure, the X-Tract comes with needle nose pliers, a 12-gauge wire cutter, 3/16" flathead and NUM2 Phillips-head screwdrivers, and a bottle/can opener, but all those tools can all be found in a better quality on some other multi-tool. What any sane person would consider as a reason to buy the X-Tract is the 420HC stainless steel, drop-point, partially serrated blade. Buck Knives has been making high quality blades for over a hundred years, with such prolific success that the term "buck knife" has become synonymous with a folding lock-blade design. All the tools on the X-Tract have this same locking mechanism to ensure functionality and safety. What any crazy person would consider as a reason to buy the X-Tract is that there are pliers. But I will say - and if you take away one thing from this review let it be this - these are some wimpy pliers. They have no power and no grip. Perhaps useful for small tasks, don't put yourself in the position of relying on these pliers. It's hard to mess up screwdrivers or a can opener, so I have no complaints with those features of the X-Tract, but if you need high-quality pliers and a high-quality blade, check out some of our Leatherman reviews instead.